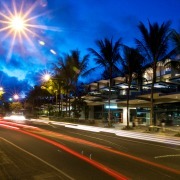 Macrossan Street is the long main street of Port Douglas, and the heart and soul of this small seaside village. The street runs from the beach to the inlet and is a hive of activity, lined with boutique shops, world-class restaurants, bars, cafes and galleries. The Port Douglas township was established in 1877 and named after an ex Premier of Queensland, John Douglas. The main street became Macrossan Street in honour of the local parliamentary member John Macrossan. The look and feel of the street reflects a classic old-fashioned tropical charm, and exploring Macrossan Street makes for a very leisurable day out. Club Tropical is situated in a prized location right on the corner of Macrossan and Wharf Street, directly opposite Anzac Park where the Sunday Markets take place. 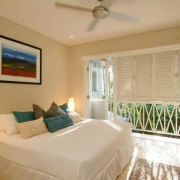 Offering a variety of Studio, 1, 2 and 3 Bedroom Suites individually decorated from tropical to contemporary styles. All studios have equipped kitchenettes on private balconies, and the apartments are all fully self contained. 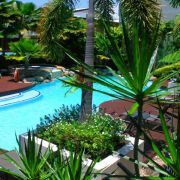 Club Tropical has a unique atmosphere of its own with water gardens, and two hot spa pools concealed behind a refreshing waterfall which cascades into the large rock sculptured freeform swimming pool. Mantra Heritage offers premium accommodation fronting Macrossan and Warner Streets. Comprising of 45 rooms nestled around 1200 square metres of saltwater lagoon pools and spas, the Mantra Heritage offers the best of a central location combined with a relaxed holiday atmosphere that provides the perfect holiday base to explore the wonders of Port Douglas. Martinique on Macrossan is just a stones throw from Four Mile Beach. 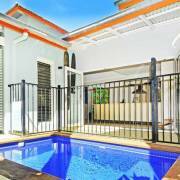 Ideally suited to couples, the property offers boutique apartments that are set amongst tropical gardens. There is a private heated swimming pool, and the peaceful, tranquil surrounds make it perfect for relaxing with a good book. Davidson Street is the main street into town connecting with Macrossan Street and also where many holiday resorts, houses and apartments are based. Port Douglas restaurants are among the best in Australia, and Macrossan Street alone has a great variety of dining experiences to choose from. Whether you are after Mediterranean, Chinese, Thai or a real Aussie steak and BBQ with kangaroo or crocodile, you are certain to find it on Macrossan Street. With access to local quality seafood all year round, you can find the freshest of seafood specialities at many Port Douglas restaurants. Salsa Bar & Grill is one of Port Douglas premier dining restaurants and has been welcoming locals and visitors alike through its doors for over 17 years. Winner of numerous Restaurant and Catering awards including Best Restaurant, Best Alfresco Dining and Best Modern Australian; this trendy restaurant is situated in a timber Queenslander with wraparound verandas, and specialises in tropical modern Australian cuisine. Salsa’s reputation derives from its amazing and eclectic menu, extensive wine list, professional and friendly staff as well as a bustling and vibrant atmosphere. It is the perfect place for a lazy Lunch, or late night Dinner and Drinks, bookings in advance are highly recommended! For an extra special dining experience, visit Nautilus Restaurant, the only truly outdoor dining restaurant in Port Douglas. Set in lush tropical gardens and spanning over three dining areas, Nautilus remains the icon restaurant of Tropical Queensland with a history matched by very few other Australian restaurants. 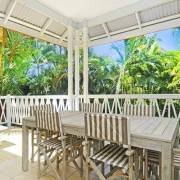 Approaching 60 years of operation from it’s original site in Port Douglas, Nautilus has endeavoured to maintain a maximum of the old atmosphere in this special, open air, private rainforest setting. The atmosphere is WOW, the beauty unique, and the five star food and five star service will exceed your expectations. Zinc Restaurant & Lounge Bar, is an award-winning establishment which is a restaurant by day and lounge bar by night. Located in the Portico building on the corner of Macrossan and Davidson Streets, Zinc has a focus on fresh, local seafood and modern Australian cuisine. The Lounge Bar is the perfect place to enjoy a cool beverage, cocktail or glass of wine, whilst taking advantage of the free wi-fi service. Stop by during the day for a coffee, cake, cocktail and snack, or enjoy a relaxed evening dinner with a selection of beautiful wines. Children are welcome. You will find pretty much everything you need along Macrossan Street; from clothing and souvenier boutiques stocking everything from flip flops to resort wear, to designer boutiques featuring all the usual brand labels such as Louis Vuitton, Coogi and Lacoste. Unique souveniers include arts & craft from prominent local and regional artists that you will find displayed in the various galleries dotted along on Macrossan Street, as well as some indigenous Aboriginal designs. The Port Village shopping complex features a broad range of specialty shops and chain stores including a Coles Supermarket, Macrossan Street Pharmacy, various specialty shops, cafes and medical centre so you can pick up all the necessities. Portico shopping centre is located on the prime corner of Macrossan and Davidson Street, and is home to a wide range of specialty shops, take aways, a gym and award-winning restaurants such as Zinc Restaurant & Lounge Bar and Finz Seafood Restaurant. The famous Port Douglas Sunday markets have been a tradition for almost 20 years. Held in Market Park, which adjoins ANZAC Park, the Port Douglas Sunday Markets provide locally made hand crafted goods of every description. Weave your way around bustling market stalls that featur an array of handcrafted items, amazing paintings, jewellery, clothing, photography, card readings, massage and the freshest, local seasonal produce from nearby properties. The Port Douglas Markets became a Cotters Market in 1998, thereby ensuring that the goods offered for sale are made by the stallholder or their immediate family. It's a great spot for finding unique souveniers. You will also find music, entertainers and buskers, which give the markets a lively atmosphere. Market hours are from 8am until 1.30 pm. It's a great way to spend Sunday morning, followed by a coffee at one of the popular cafes in Macrossan St or at the Marina Mirage. Four Mile Beach features glorious golden sands that extend for 4 km from the base of Island Point at the end of Macrossan Street, to the rocks, reefs and mangroves of the Mowbray River mouth. The beach is low, flat, and at low tide up to 200m wide, which makes it perfect for bike rides and many sand sports. The Macrossan Street end of the beach is the most accessible and popular with visitors. This area is life guard patrolled with a stinger net during the stinger season months which run from Nov - June. The Port Douglas Surf Life Saving Club & Bistro is located on the corner of The Esplanade and Mowbray Street, this is the closest eating and drinking spot to Four Mile Beach. This popular bistro is suitable for families with a kids playground. There is a huge licenced grass area where you can enjoy some Aussie beers and a game of Bochi. The Douglas Shire Historical Society's 17 sponsored photoposts guide you on a walk around the town precinct, pinpointing historical sites and explaining their significance with photos and text. The 4km walk takes a leisurely 2 hours to complete and starts at the Port Douglas Court House Museum. You can pick up a self guided walking map from the Port Douglas Tourist Information Centre or you can call into the Port Douglas Museum (near Anzac Park) for the trail map and more information. Flagstaff Hill Lookout & Signal Flagstaff which can reached by turning right at the end of Macrossan Street and following the signs. After a moderate climb to the top of Flagstaff Hill you will discover breathtaking views of Four Mile Beach, Mowbray River, the coastal ranges towards Black Mountain and the Coral Sea. It is well worth bringing your camera for this picture postcard photo opportunity. The Waterfront Precinct within the present Anzac Park and Market Park was the heart of the port from 1877. Located here was the Customs Office, Bond Store, Divisional Board's Office, tramway station, loco repair buildings and wharf. St.Mary's by the Sea, the second Catholic Church building now stands on the site of the tramway workshop. It was relocated to the waterfront precinct in 1988 and refurbished by the Port Douglas Restoration Society. Known today as St.Mary's-by-the-Sea it is used for non-denominational services, weddings and funerals. Douglas Shire Council "Sugar" Wharf. An 1878 stone jetty at the northern end of Wharf Street serviced shipping that anchored out in deeper water - always uncomfortable for passengers rowed ashore. In 1905, Douglas Shire Council's new wharf on Dickson Inlet berthed coastal steamers, later to be used for storage and export of bagged Mossman mill sugar. 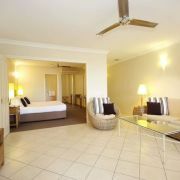 North Australian Hotel (Central Hotel). Denis O'Brien is listed as hotel keeper of the North Australian in Willmett's Almanac of Queensland from 1878. It was originally called the Reefer's Arms in keeping with the port's gold mining association. The two storey building of today replaces the single storey hotel destroyed by the big cyclone of 1911. Buchanan's Family Hotel (Court House Hotel). William Buchanan built his hotel on this highly desirable corner location in 1878 and changed its name with the opening of the Court House in 1879. The original single storey hotel on Macrossan Street was damaged by the 1911 cyclone and rebuilt together with this abutting two storey building (modified in 2000).